If you return your order antime within 30 days, we'll send you your money back. Fill out any PDF form with FillAnyPdf.com! FillAnyPDF.com is a website where you fill it out, sign, and send forms, all online! No software is needed. Any PDF (or MS Word) form can be used, even if it's not "interactive", so you can get started right away. You can also invite people or groups to fill out your forms and track the results without forcing them to download, print, scan or fax! 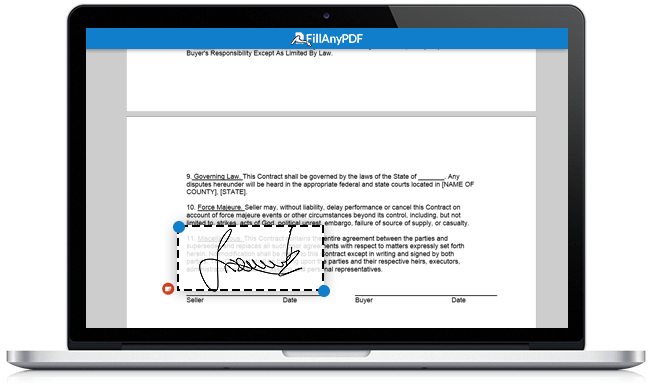 Anyone that fills out forms or collects signatures and filled out forms from others will find FillAnyPDF.com to be a valuable time-saving resource. In our modern world, it is becoming more common to share documents in a digital format using an online PDF editor, which can make it easy to do business with people from all over the world. If you are sharing business or legal documents in a digital format, then it is important to be sure that you are using an online tool to gather a digital signature when the agreement is made. you can easily sign documents and gather a digital signature from the other parties involved. When an electronic signature is used on a document, it is a mathematical process that authenticates the person that sent the document. This mathematical process helps you to know that the documents were sent without alterations, because the process is difficult to imitate. Additionally, a digital signature can be time-stamped, and they create documents that are just as legally-binding as a printed contract that was signed in person. Sign forms online and request others to do the same. The main advantage to this format is the fact that it is paper-free, and there is no need to download a software or print out papers to sign by hand. Once the document is signed, you don't need to mess with the filing or storing the paperwork. which means that your documents will be legally-binding once they are signed by all parties involved. The PDF writer makes the signed data unalterable and the documents are tamper-proof, helping to ensure the safety and accuracy of your business deal. Edit PDF online and then quickly send it to the recipient. No need for certified mail or a courier, because the document can be sent anywhere in the world in a matter of moments. This instantaneous process helps to speed up your business deals, and you don't have the lag time when you are waiting for the documents to be sent.